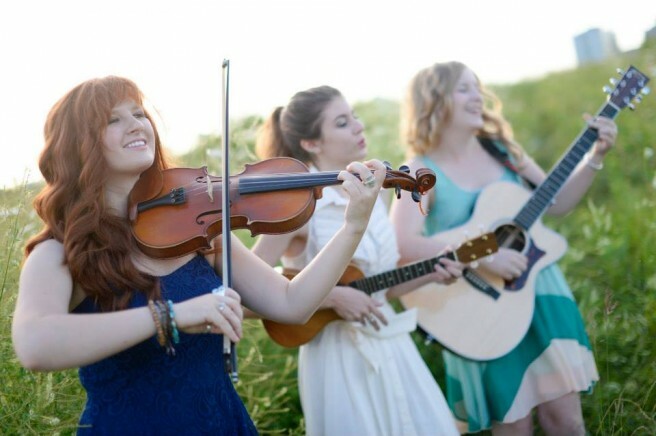 Ottawa folk trio The Musettes bring The Good Lovelies to mind. The Musettes’ first EP, Wanderlust, has that soothing-yet-soulful quality evident in the work of that other folk trio of international renown. The Musettes play fiddle, guitar, ukulele, drums, melodica and mandolin — and use their own voices as instruments — on the five-song EP produced by Jonathan Chandler of the band Amos the Transparent. They also have a knack for whimsy and well-chosen cover tunes. Their version of I Will Wait by Mumford and Sons has more than 35,000 YouTube views. They’ll bring those group harmonies and foot-stomping sounds to St. Luke’s Church on Saturday, June 21 for their EP release party. Ahead of that gig , Sound Seekers asked The Musettes a few questions. Introduce everyone? Who is in The Musettes? The Musettes are Rachel Harrison, singer, guitarist and songwriter extraordinaire! Meaghan LaGrandeur (singer, fiddler and songwriter!) and Lora Bidner, who is an amazing singer, piano player and songwriter. When and how did you come together? We all met at Canterbury High School and graduated from the music program. Your name! Are you referring to a style of music? An instrument? A haversack? Being muses? We came up with the name before our first gig at Zaphods. During high school, a friend had asked us if we’d open for his band and we agreed — we hadn’t considered ourselves a band at all up until that point and we needed a name for the bartender to write on the chalk board sign out front. In the end, we searched wikipedia for “musical terms” and “Musette” popped up. It felt catchy and also applied to “Muse” which in Greek Mythology refers to the goddesses of literature, science, and art. Could you tell us more about the sentiments behind your single, Wanderlust? Wanderlust embodies the love for travel and is about embracing new horizons. Rachel wrote this song while backpacking through Europe. Your record brings to mind groups such as The Good Lovelies. Are they an influence? Tell us about some of your other influences. The Good Lovelies have been a tremendous source of inspiration for us over the years. We were absolutely ecstatic when the Ontario Council of Folk Festivals selected us for their young performers program, especially because we were mentored by Sue Passmore from The Good Lovelies. She has continued to be so supportive ever since! She is a huge mentor, we really look up to her and the rest of the band. We also had the chance to perform with Serena Ryder in Ottawa. It has been amazing being able to work so closely with Juno-winning female artists who have had such successful careers. Annabelle Chvostek (she was nominated for a Juno last year and also used to be a member of The Wailin’ Jennys) is also amazing and has invited us to sing back harmony up for her on several occasions, she is another fabulous influence. Female mentors can be hard to find in this industry, which tends to be male dominated. We are extremely grateful to them for helping us on our journey so far. Tell us about your live show. What’s it like? What’s in store for your CD release party? The EP launch show on the 21st will feature our usual three-part harmonies, guitar, fiddle, mandolin, and ukulele. For this show, we’ve spiced up our act even more, and have a few tricks up our sleeves! Justice R.F will be opening, he’s super fab, such a great fella. We have added some piano as well as a bassist and a drummer so our sound will be even bigger, we’re really looking forward to it. We also have a new song, which is rich in harmony, instrumentation and foot stompin’. Our live shows are SUPER high energy, tons of jumping, dancing, and occasionally I get so excited, I end up tossing my platform shoes in the crowd! There’s always a surprise in store! The Musettes EP release party happens Saturday, June 21 at St. Luke’s Church, 790 Somerset St.